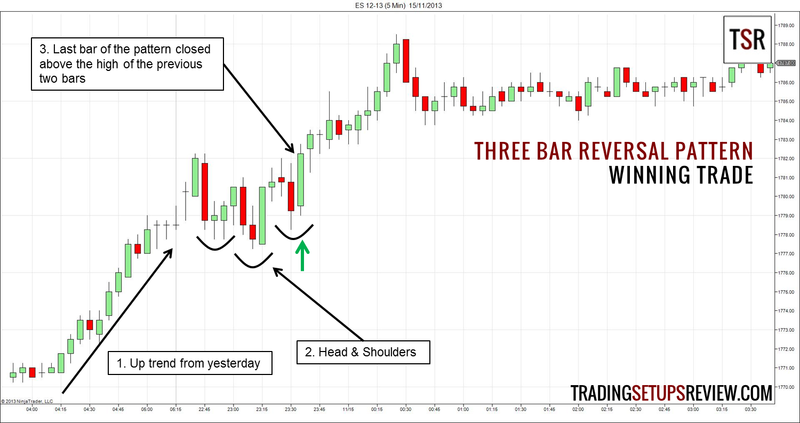 Alton Hill from TradingSim, a day trading simulator, wrote about an enhanced three bar reversal pattern for day trading. 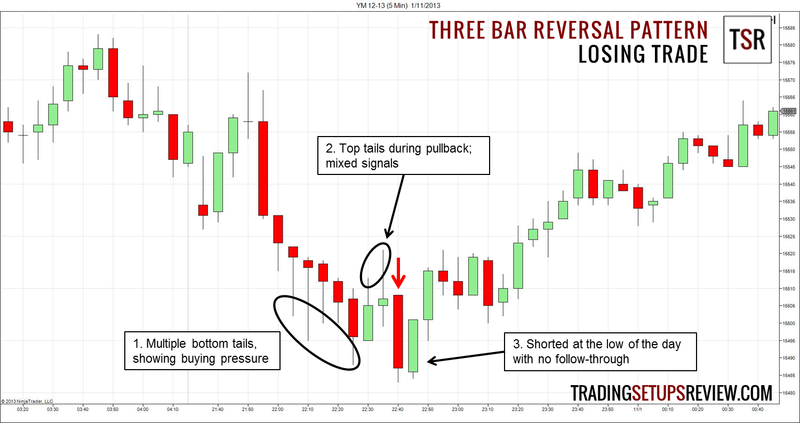 According to Alton Hill, three-bar reversals are too common in intraday time-frames. To select the best three-bar reversal patterns for day trading, he wants the third bar in the pattern to close above the highs of the first two bars. 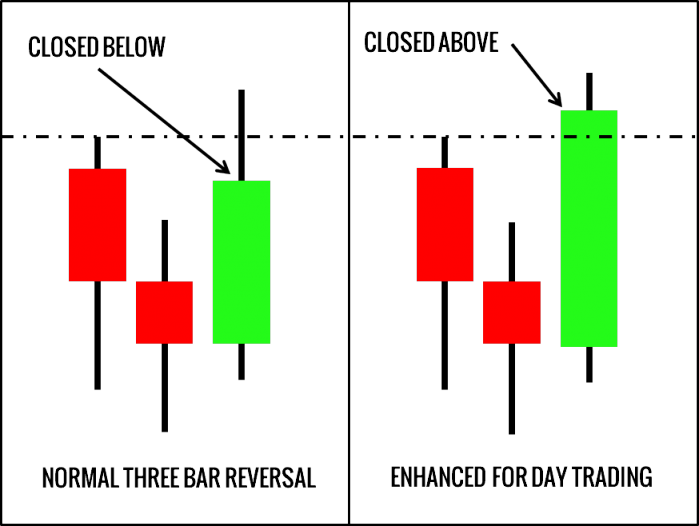 The diagram below demonstrates the difference between the usual three-bar reversal pattern and Alton Hill’s day trading version. This a 5-minute chart of ES futures. It shows the regular session. I included part of the previous section to show the up trend that ended yesterday. After our entry, the prices drifted up for the rest of the session. The previous session ended with a strong bull trend. The last bar of the pattern closed above the highs of the two previous bars. That was our signal to buy. This is a 5-minute chart of E-mini Dow contract. Despite a strong signal bar, the pattern failed immediately after entry. Although prices were dropping consecutively for seven bars, the increasing buying pressure is obvious as the bars show long bottom tails (shadows). Tails developed at the top of the bars during the pullback upwards. Tails on both top and bottom of the bars are giving us mixed signals, implying that prices might be congesting soon. If we ignored the above warning signs and shorted the three-bar reversal pattern, it is difficult to find a worse entry point. This modified three-bar reversal pattern is impressive. A simple rule has turned this commonplace pattern into a powerful setup. 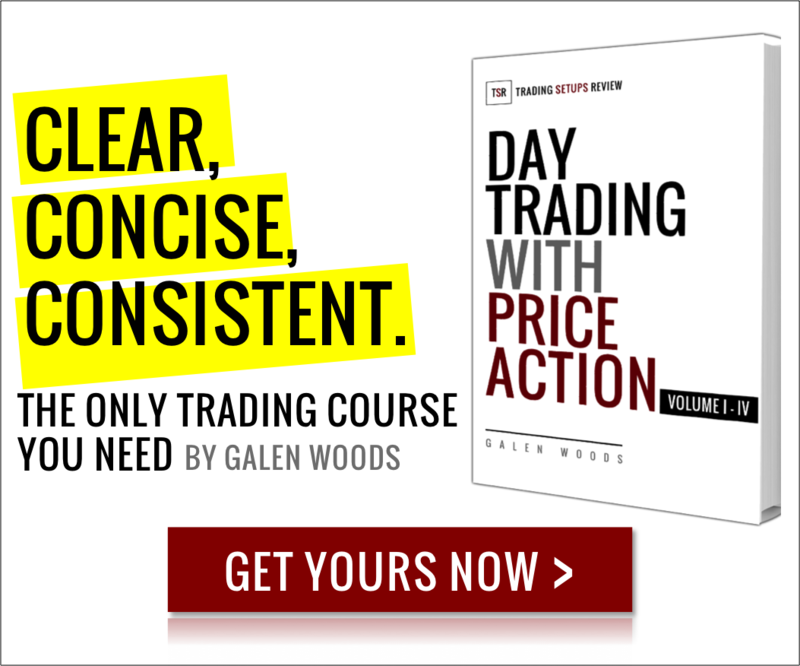 You can easily combine this pattern with other indicators or price patterns to find high probability trade setups. The winning example is a great combination of a head and shoulders formation and a three bar reversal pattern. However, due to the extra rule, the signal bar (Bar 3) tends to have a large range. As our stops are usually placed on the opposite end of the signal bar, the trade risk might be higher. We should either cut down our trade size or tighten the stop if possible. If you are unable to manage the risk, then skip the trade setup. One last point to note is that if the middle bar of the pattern is an outside bar, be very careful. Outside bars often precede wild and unpredictable price action. Need an indicator to help you find the Three-Bar Reversal? Click here. If you want to read more about three-bar patterns, you must take a look at our review of Johnan Prathap’s Three Bar Inside Bar Pattern and Thomas Bulkowski’s “Are Three Bar Patterns Reliable for Stocks?” article in Technical Analysis of Stocks & Commodities magazine.